DISTRICT EIGHT CHAMPIONS — The Washington C.H. 11-year-old all-stars captured the Little League District Eight title with a 16-0 win over Eaton Sunday, July 9, 2017. The team is State-bound and will continue tournament play Saturday, July 22 in Cambridge. The team is pictured at home plate on the field at Fairborn Little League after beating Eaton. (front, l-r); Will Miller, Justin Robinson, Ben Mathews, Bryson Osborne, Hunter Hinkley, Jacob Miller, Bryce Yeazel; (middle, l-r); Coleden May, Hunter Allen, Luke Crabtree, Corbin Melvin, Isaiah Haithcock, Evan Lynch (back, l-r); manager Ryan May and assistant coaches Bob Robinson and Brian Yeazel. Justin Robinson delivers a pitch for the Washington C.H. 11-year-old Little League all-stars in their District Eight championship game against Eaton played Sunday, July 9, 2017 at the Fairborn Little League field. Corbin Melvin swings at a pitch for the Washington C.H. 11-year-old all-stars during the District Eight championship game against Eaton played on the field at Fairborn Little League Sunday, July 9, 2017. Isaiah Haithcock scores for the Washington C.H. 11-year-old Little League all-stars during the District Eight championship game against Eaton played in Fairborn Sunday, July 9, 2017. FAIRBORN — On a delightful Sunday afternoon, July 9, the Washington C.H. 11-year-old Little League all-stars met the all-stars from Eaton on the field at Fairborn Little League’s home field for the District Eight championship game and a spot in the State tournament which is being held at Cambridge. Washington won the game, 16-0 in four innings. They finish the tournament with a record of 3-0 after a 16-1 win over First Dayton and a 19-1 win over Fairborn. Justin Robinson and Corbin Melvin combined to pitch a no-hitter for Washington. Robinson started and pitched 1.1 innings. He walked two and struck out three. Melvin came on in relief and pitch 2.2 innings with one walk and five strikeouts. Washington collected 16 hits in the game and committed three errors. Offensively for Washington, Bryce Yeazel went 2 for 3 with one RBI and two runs scored; Jacob Miller was 2 for 2. He was hit by a pitch, reached on an error, scored twice and drove in one; Isaiah Haithcock went 2 for 3 with two runs and one stolen base. He also got on base via an error; Hunter Allen was 1 for 2 with one RBI and one run scored. Melvin went 2 for 2 with a walk, one RBI and three runs scored; Coleden May was 1 for 2 with a double and two RBI; Evan Lynch was 2 for 3 with two runs scored and two stolen bases; Robinson was 1 for 2 with a double and two RBI. Will Miller was 1 for 2 with one run scored; Bryson Osborne was 1 for 1 with one RBI and two runs scored; Luke Crabtree was 0 for 1 with one RBI; Ben Mathews reached on an error and scored one run and Hunter Hinkley was 1 for 1 with one RBI. Washington scored all the runs they would need with four in the bottom of the first. With one out, Jacob Miller was hit by a pitch. Haithcock had an infield hit with Miller at third. Haithcock stole second and Allen singled, scoring Miller with what would turn out to be the game’s winning run. Melvin had an infield hit that scored Haithcock to make it 2-0. May drilled a double that scored Allen and Melvin for a 4-0 tally. May overran second and was tagged out and the next batter was retired to end the inning. Washington scored one run in the second after the first two batters were put out. Yeazel singled to right and went to second on a passed ball. Jacob Miller drove Yeazel in with a single to push the score to 5-0. Haithcock drilled a line drive back to the mound that hit the pitcher. After a few moments, the young man from Eaton, Garren Davidson, was back on his feet. He was taken out of the game likely as a precaution. Eaton brought in Michael Letner to pitch. Washington stranded two runners without further scoring in the second. Eaton attempted a rally in the third, helped by a walk and two Washington errors. The bases were loaded with one out, but Melvin was able to strikeout the next two batters to keep the shutout intact. Washington put the game away with 11 runs in the bottom of the third. Melvin began the inning with an infield hit. With one out, Lynch had a bunt single that advanced Melvin to third. Lynch stole second and Robinson followed with a double, scoring Melvin and Lynch to make it 7-0. Will Miller singled and Osborne was sent in to run for Robinson. Yeazel hit into a fielder’s choice, but an error on the play allowed Osborne and Miller to score to increase the margin to 9-0. Jacob Miller reached on an error and he soon stole second. Haithcock reached on an error that scored Yeazel and Miller to set the score at 11-0. Crabtree grounded out, driving home Haithcock. Melvin walked and Mathews reached on an error. Lynch singled, scoring Melvin to make it 13-0. Osborne then had an infield hit that scored Mathews. This marked the end of the day for Letner pitching for Eaton. Hinkley greeted the next pitcher with a single that scored Lynch. Yeazel then singled back up the middle, scoring Osborne to make it 16-0. Jacob Miller also singled to load the bases, but the next batter was retired to end the inning. The first batter for Eaton reached on an error to begin the top of the fourth. A strikeout and back-to-back ground outs brought the game to its conclusion. “I’m extremely proud of these kids,” Washington manager Ryan May said. “They have worked hard. We practiced them really hard. We worked five straight days one week to just to get ready for this. “They’ve bought in to the team concept,” May said. “We have 13 really good baseball players. I couldn’t ask any more out of them. “I would like to thank Tyler StClair, our league president,” May said. “He’s done a lot of things for our league this year. He’s just overall really good for our league. “My coaches were Bob Robinson and Brian Yeazel,” May said. “Bob’s very knowledgeable and he’s been great with the kids. He’s taught me things at times. Brian has a great background in baseball, as well. Brian and I have been coaching for a long time. I couldn’t ask any more of Brian. “I have some great parents,” May said. “We couldn’t do this without them. They sacrifice so much for these kids, financially and with their time and energy for these kids and it pays off. Last year, May managed the 10-year-old all-star team that went to State. The team went 0-2, falling to Cambridge, 9-6 in the first game. Washington was later run-ruled by Boardman, the team that went on to capture the State Little League title for this age group. Washington will play the District Three champion Saturday, July 22 (the time is to be determined. 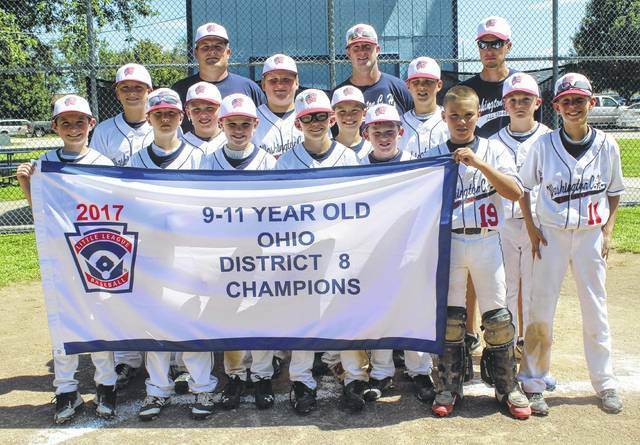 https://www.recordherald.com/wp-content/uploads/sites/27/2017/07/web1_WCH-11-year-old-all-stars-win-Dist-8-title-7-9-2017.jpgDISTRICT EIGHT CHAMPIONS — The Washington C.H. 11-year-old all-stars captured the Little League District Eight title with a 16-0 win over Eaton Sunday, July 9, 2017. The team is State-bound and will continue tournament play Saturday, July 22 in Cambridge. The team is pictured at home plate on the field at Fairborn Little League after beating Eaton. (front, l-r); Will Miller, Justin Robinson, Ben Mathews, Bryson Osborne, Hunter Hinkley, Jacob Miller, Bryce Yeazel; (middle, l-r); Coleden May, Hunter Allen, Luke Crabtree, Corbin Melvin, Isaiah Haithcock, Evan Lynch (back, l-r); manager Ryan May and assistant coaches Bob Robinson and Brian Yeazel. 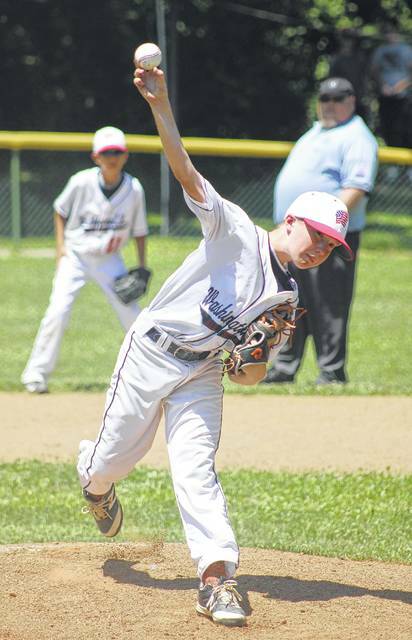 https://www.recordherald.com/wp-content/uploads/sites/27/2017/07/web1_Justin-Robinson-pitch-11-year-olds-v-Eaton-7-9-2017-use-this-one.jpgJustin Robinson delivers a pitch for the Washington C.H. 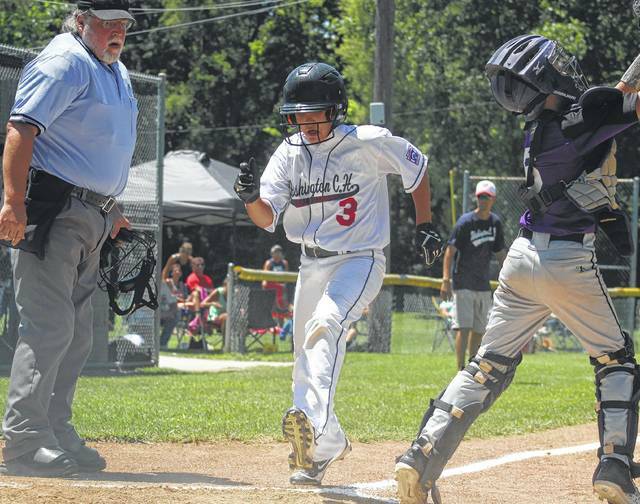 11-year-old Little League all-stars in their District Eight championship game against Eaton played Sunday, July 9, 2017 at the Fairborn Little League field. 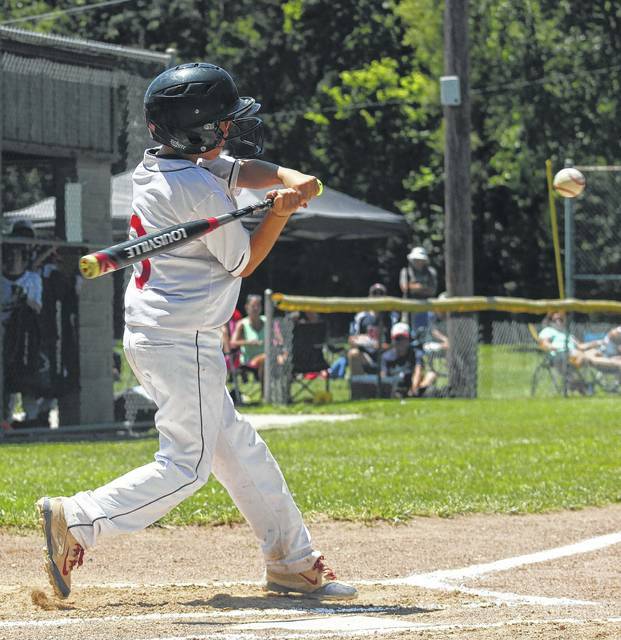 https://www.recordherald.com/wp-content/uploads/sites/27/2017/07/web1_Corbin-Melvin-at-bat-WCH-11-year-olds-vs-Eaton-7-9-2017.jpgCorbin Melvin swings at a pitch for the Washington C.H. 11-year-old all-stars during the District Eight championship game against Eaton played on the field at Fairborn Little League Sunday, July 9, 2017.
https://www.recordherald.com/wp-content/uploads/sites/27/2017/07/web1_Isaiah-Haithcock-scores-for-WCH-11-year-olds-vs-Eaton-in-D-8-title-game-7-9-2017.jpgIsaiah Haithcock scores for the Washington C.H. 11-year-old Little League all-stars during the District Eight championship game against Eaton played in Fairborn Sunday, July 9, 2017.